Adam Lambert, the headliner at the Kiss 92.5 Wham Bam 2010 concert in Toronto on June 19th, sat down with Roz & Mocha to talk about how his life has changed since ‘American Idol’, how he loves Toronto, shaving the side of his head fans concerned he shaved it all off after a photo he Tweeted in a hat (above), the infamous AMA kiss, being surprised at the cross section of people attending his shows, and finding his own way to have the gay rights flag by being comfortable in his own skin and “just being me”. Adam then applied some eyeliner to Mocha before explaining what fans can expect at his live show. Watch it via YouTube below the cut. 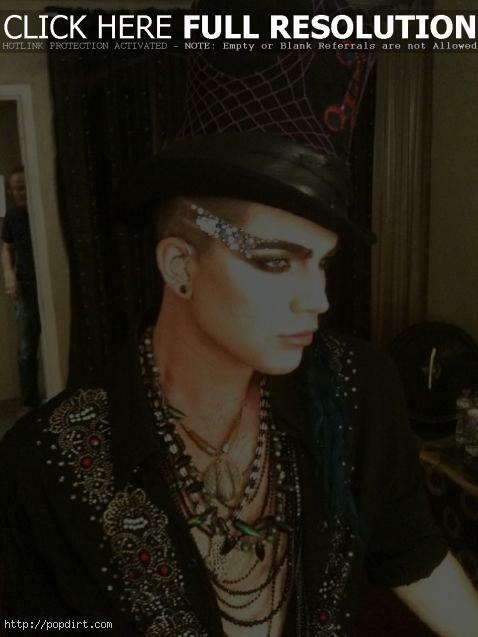 Adam’s awesome in every way and yes I am one of those passionate obsessive Glambert. Great interview. Adam Lambert is so articulate and charming. He loves being there as much as they love him there. I am so happy for Adam for love he receives whenever he is there. Lovely interview by the way, you all really know how to have fun and Adam is always so fun and honest. LOVE ADAM LAMBERT AND LOVE YOU ALL LOVELY PEOPLE FOR LOVING ADAM AS YOU DO. THANK YOU!!!!!!! !